At the time of her appearance in the influential 2000 anthology Calyx: 30 Contemporary Australian poets, MTC Cronin had already presented herself as one of the most distinct voices among the new poets to have emerged in the 1990s. 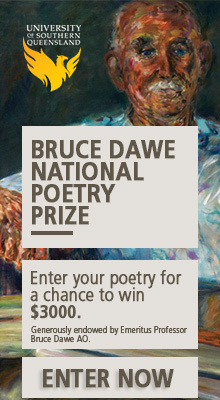 The success of her subsequent collections such as The Flower, The Thing, which won the 2005 Victorian Premier’s Literary Award in Poetry, further established her as one of main figures in the generation of poets who practiced – to use the term suggested by the poet and critic David McCooey, also in 2005 – a ‘new lyricism’. It could be said that Cronin’s work was ‘new’ in its terse and self-reflexive use of language, and ‘lyrical’ in its application of poetic tropes educed by nature and sensual love. Her latest, long awaited collection is both a great addition to her body of work and the sign of a new development in the poetics of this important contemporary poet. The most immediately impressive aspect of The World Last Night [metaphors for death] is Cronin’s obvious lack of interest in the aesthetic regimes that have dominated much of the Anglophone poetic landscape since the 1970s. Although, as mentioned before, there is no denying the sophisticated materiality of her syntax – which brings to this reader’s mind the sharp austerity of the poetry of many a modernist, from HD to Michael Palmer – Cronin’s is not a poetic that readily accepts and dwells within the confines of a non-signifying language. when I am here no longer? like a shadow in reply. It is only the morning carrying with it the northwest. An interest in the intersection of the textual with the phenomenological has been present in much of Cronin’s work – in, for example, the aforementioned earlier collection in which ‘the flower’ as simply a linguistic sigh is put to task by ‘the thing’ that has the corporeality of an experienced entity with a scent, colour, texture, etc. – but what is unique in her new collection is that these contradictions, and their resulting conceptual stimuli, form the backdrop to a discourse on mortality and impermanence. This book strikes me as Cronin’s most contemplative and philosophical work to date. As its bracketed subtitle suggests, these poems are, like much of their author’s past work, exercises in exploring and interrogating the metaphor and the tenuous yet irrefutable connection between words and symbols as vehicles and their tactile yet allusive tenors. And at the same time, these poems offer terse and profound theses on the state of life being unsettled by the truths of death. According to the last lines to one of the poems, Cronin sees ‘the job of the poet’ as ‘intermittently opening the coffin / then bearing the world’s carrion aloft’. Death may seem like a macabre topic for a book of poems, but the relationship between poetry and dying is as ancient as our preoccupation with death itself, ranging from Gilgamesh’s lament for his dead friend Enkidu, all the way to the collections of modern poetry, such as Anthony Hecht’s brilliant Flight Among the Tombs, focussed entirely on the mystery and reality of life’s finitude, via the poetic accompaniments to late Medieval frescos and illuminations associated with ars moriendi (Art of Dying). Cronin’s book is an intriguing addition to this tradition, and, as with the abovementioned examples, it presents death as neither a calamity to be feared nor a Gothic/romantic allegory of sexuality. Cronin’s complex take on the theme argues that life and death are inexplicably intertwined, and that this symbiosis undermines both our perception of life as autonomous and all-consuming, and our view of death as unstoppable and all-encompassing. like a lover with an argument. for the dream at the end of each day. The dream is of life! Cronin’s conceptualisation of death as life’s ‘lover with an argument’ is one of the most intriguing ideas put forward by an Australian poet in recent times. In my view what truly distinguishes Cronin from most other contemporary poets is not her unique voice – her, for example, eschewing of culturally or topographically specific referents, or her impeccable ear for rhythm and measurement – but her interest in ideas as such. Her poetry is, in many ways, a space for contemplation on and evaluation of ontological and philosophical values. Hers is a poetry of ideas, or, put more simply, the thinking person’s poetry. 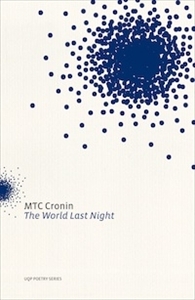 The World Last Night [metaphors for death] brings MTC Cronin perilously closer than almost any other Australian poet to being labelled a visionary. Great review Ali. Will make Margie’s week, assuming she isn’t under water!